Cruise ship stores may be fundamental money spinners but that doesn’t mean that you can’t snap up some fantastic bargains while sailing the high seas. Unlike on-shore shopping, most goods are sold tax and duty free which translates into some pretty significant savings for thrifty shoppers! Not to mention the great sales and promotions that are often run throughout the voyage. This makes cruise ships the perfect place to splash out on some souvenirs and stretch your holiday budget that little bit further. To help you decide what to buy we’ve put together this insider’s guide identifying some of the most cost effective items to pounce on while on a cruise. Forget Fifth Avenue, Champs Elysees and Rodeo Drive. 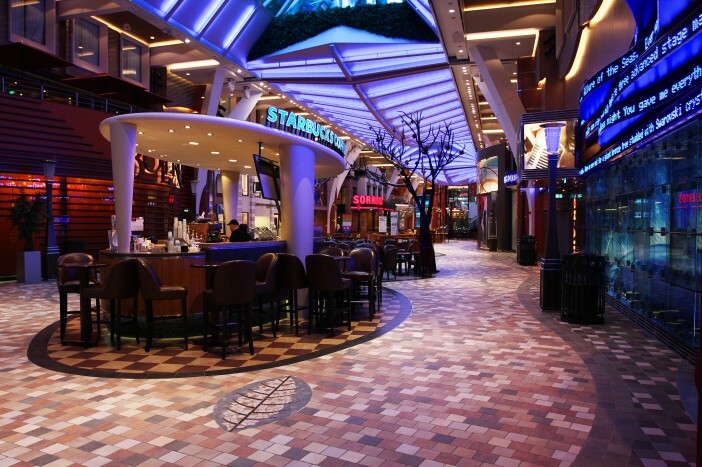 Today, cruise ships are one of the best places to pick up designer wares at irresistible prices. Most large scale cruise vessels boast impressively large shopping malls, with ships such as Oasis of the Seas and Allure of the Seas home to designer boutiques such as Coach and Guess. Celebrity’s Silhouette and Reflection feature Michael Kors boutiques, Crystal houses Versace and Silversea boasts Bulgari. According to William Butler, vice president of retail services at Carnival Cruise Lines alcohol is an unsurpassed best-seller. And with rock bottom duty free prices it’s not hard to see why! On board Carnival’s ships guests can score a 1 litre bottle of Crown Royal for just US$21.99, a huge US$15 less than the on-shore RRP. These deals apply to a huge range of high end liquors including Grey Goose, Johnny Walker and The Gold Route. Just remember that when taking alcohol home you will be limited by customs restrictions. These vary from country to country so it always pays to check before making any purchases. If you’re flying home you’ll also need to pack the bottles in your checked baggage or they’ll be confiscated at security. For those still trying to quash the habit cruise ships are great places to grab a bargain on boxed cartons of cigarettes. Prices will vary from ship to ship however they will generally be cheaper than purchasing packets on dry land. For those on the search for a little at-sea bling cruise ships never fail to disappoint. Some of the larger liners are home to gold, silver and diamonds galore, with some offering passengers access to exclusive sales. Cunard stocks ultra-luxurious Chopard rocks while Carnival regularly runs 40% off wedding and engagement ring deals. This makes cruise ships the perfect place to pop the question! If you’re more of a quantity over quantity kind of shopper cruise ships will also see you spoilt for choice. Most vessels feature budget friendly jewellery and accessories stores that are overflowing with pretty trinkets at bargain prices. Watches are fabulous investment pieces and cruise ships offer some fantastic deals on high end time pieces for both ladies and men. Lines such as Carnival deliver an official catalogue to all cabins which features great deals on leading brands such as Citizen, Bulova and the Invicta collection. You might even be able to secure up to 40% off! Passengers sailing with Celebrity Cruises enjoy exclusive access to official Apple products. The line is the world’s first at-sea Authorized Apple Reseller and stocks a limited range of MacBook Pros, iPads, iPhones and iPod touches. There are only so many per ship though so passengers are advised to get in quick if they want to secure a net generation device! Thanks to the lack of tax cruise ships are a terrific place to stock up on all your favourite scents. Whether you spritz Chanel, Marc Jacobs, Tommy Hilfiger or Estee Lauder most vessels will offer a well-stocked selection of designer perfumes priced at up to 25% less than what you would pay on-shore. Makeup is another product where there are significant at-sea savings to be had. Product diversity will vary from ship to ship however you’ll generally find lotions and potions from leading brands such as Estee Lauder, Clinique, Elizabeth Arden and Lancôme. Crystal Serenity also houses the world’s first floating Christian Dior store for the ultimate in at-sea beauty. If you’re heading to a sun kissed destination on-board shops are a great place to splash out on a pair of designer sunglasses. Brands such as Oakley and Ray-Ban are commonplace and can be purchased for around 10% less than RRP. What better way to remember your trip than with branded logo merchandise that you can continue to enjoy long after your cruise holiday draws to a close? T-shirts, sweaters, magnets and other items will often go on sale towards the end of the cruise which could make it worthwhile holding out until the final days. Of course, if you really have your heart set on something it could be a good idea to snap it up as early as possible to avoid disappointment. Have we convinced you that cruise ships are a fantastic place to splurge on indulgences or stock up on everyday essentials? Secure your cabin now with a fantastic deal from the cruising experts at Cruise 1st. Thanks to the great deals on global getaways you’ll enjoy even more cash to spend on everything from designer clothing, high end jewellery and luxury makeup to discounted alcohol, state-of-the-art electronics and branded cruise ship merchandise.